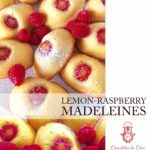 This recipe uses a full-sized madeleine pan, fills it with an airy lemon-flavoured madeleine batter, sticks a fresh raspberry in the middle, and then pumps that raspberry full of delicious lemon curd. Then I dust that delicious madeleine with icing sugar. Why? Because, I can. And you know what else? It tastes even better than it sounds! 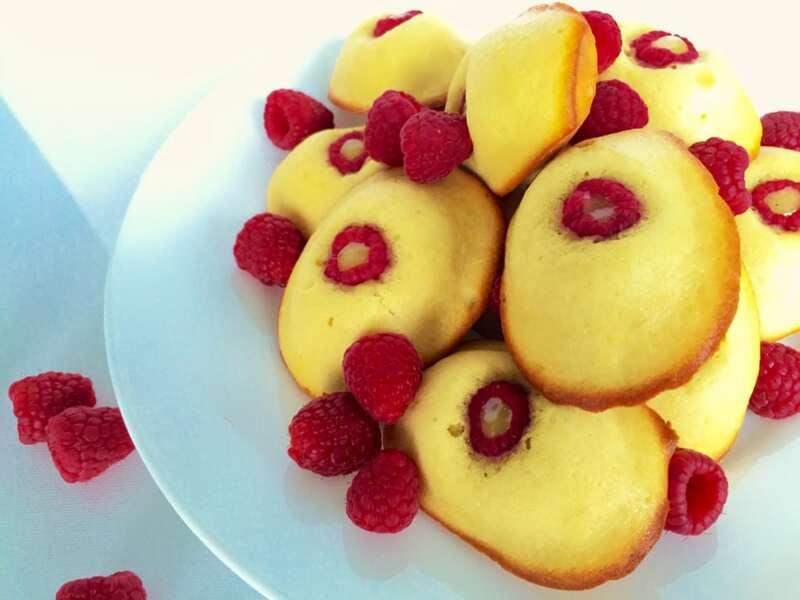 Lemon-Raspberry Madeleines are a treat you don’t want to miss! Did I mention this recipe is really rather easy to make? I didn’t, did I? Well… it is! If you don’t happen to have any lemon curd on hand, it’s available in many larger supermarkets. Should you however want to make your own lemon curd, I’ve already provided a recipe in my Lemon Curd Cake with White Chocolate Buttercream Frosting post! Of course, if you’re just looking for a bunch of madeleine recipes, you can also try out my Lemon & Poppy Seed Mini Madeleines – it was one of my earliest recipe posts, and people have always come back with amazing things to say about them! 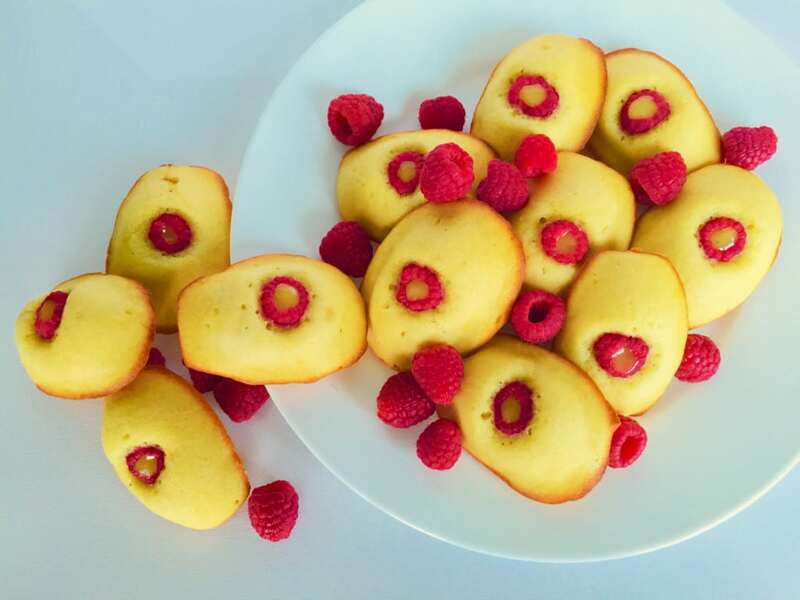 In that post I actually mention the inspiration for this recipe… Lemon-Raspberry Madeleines are also in The Little Paris Kitchen, Rachel Khoo’s excellent cookbook. My version doesn’t follow her recipe, but I was certainly inspired by it! 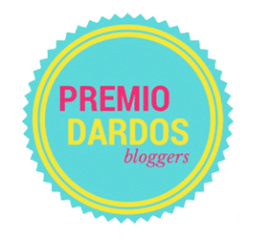 In other news, I was nominated for the Premio Dardos Award! The award exists to acknowledge the values that every blogger shows in their effort to transmit cultural, ethical, literary, and personal values every day. These stamps were created with the intention of promoting fraternization between bloggers, a way of showing affection and gratitude for work that adds value to the Web. Plus, readers get the chance to discover new, interesting blogs. All in all, it’s a win-win situation. Sounds good, right? Thank you to Leisel from Skill Up Skillet for nominating me. If you’ve not been to Leisel’s blog, you should definitely check it out – it’s a food blog inspired by video games. Seriously, it’s that cool! So what can I tell you about me? There’s not much really, I’m not the most interesting person around. Ever since I moved to Canada, I’ve not been able to leave the house without obsessively checking the weather forecast; I’ve broken all ten fingers (what? You haven’t? ); and I find it really uncomfortable to drink a glass of water with my eyes open (it’s rude to stare, after all)! Now on to the good stuff, there are two bloggers in particular that I’ve been wanting to mention in one way or another for ages now! Felechia, from Leafy Greens and Chocolate, is so incredibly talented. And though it’s been a little quiet recently, her blog is dedicated to delicious vegetarian and vegan dishes! And did I mention, she’s incredibly talented? Old Fat Guy was one of the first bloggers to reach out to me and say hello! He prepares great, authentic home-cooked meals, with a particular focus on smoked foods. I love that his recipes are a genuine no-nonsense approach to home-cooking! Don’t forget to comment below, let me know what you think of the recipe. Visit Leafy Greens and Chocolate, and Old Fat Guy! If you liked it, share this post (it helps!). And as always, follow me on Facebook, Instagram, Twitter, and Pinterest! 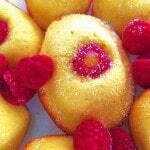 A delicious and easy recipe for Lemon-curd and raspberry stuffed madeleines. 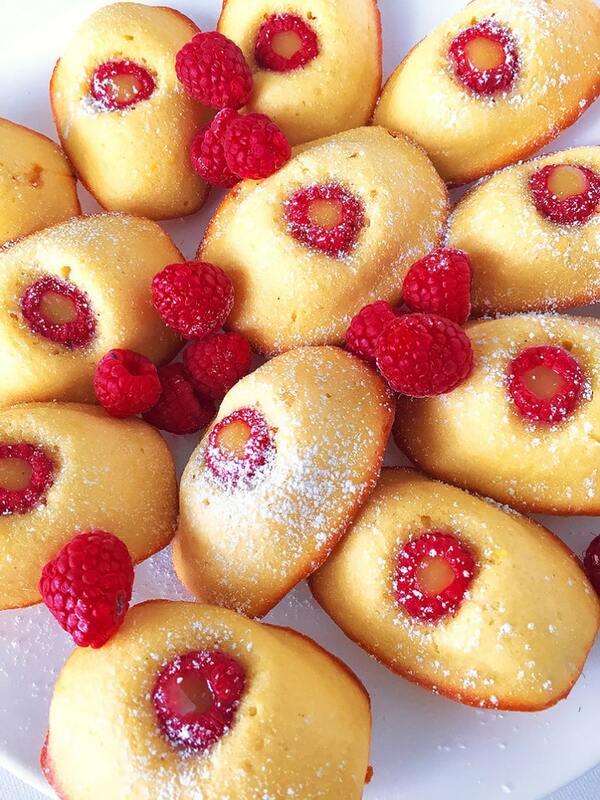 These Lemon-Raspberry Madeleines are fantastic! In a separate bowl, whisk together the eggs, white and brown sugar, maple syrup, lemon zest, and water until a smooth mixture is produced. Whisk the dry ingredients in until just incorporated, and then add the butter, whisking until the mixture is smooth and sticky. Cover your bowl with cling film, and chill in the refrigerator for at least one hour, ideally overnight. Preheat oven to 400 degrees F. Lightly coat a madeleine pan with butter and dust with flour, tapping out any excess. Pipe or spoon (it doesn’t affect the shape of the madeleine) the batter into the pan, filling each madeleine well about two thirds full. Place one raspberry “open-side”-up in the centre of each madeleine well. Bake for 8-10 minutes, until edges are browned slightly and spring back when pressed lightly. Tap to release the madeleines. 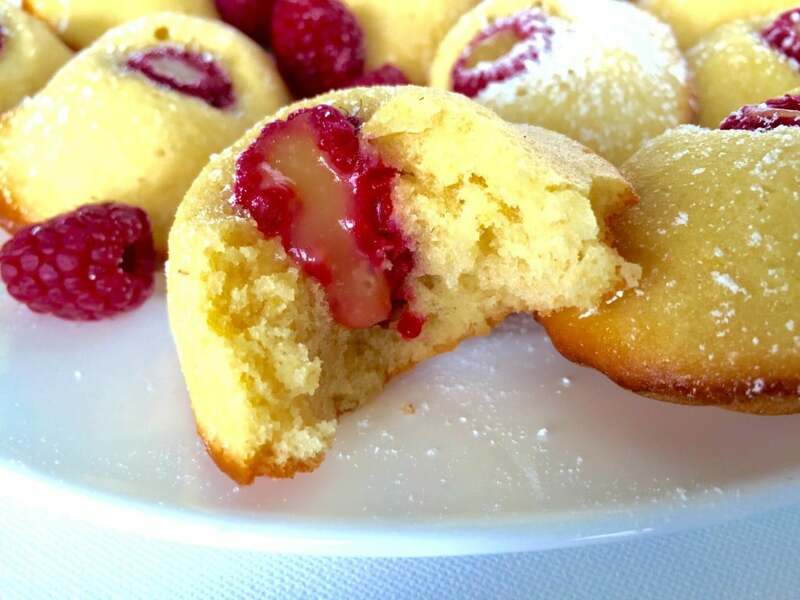 Pipe lemon curd into the warm madeleine through the opening in the raspberry. Dust with icing sugar. Serve warm. This post contains affiliate links. If you happen to click on one of these links and then make a purchase from that retailer, I will likely receive a commission (but not enough to buy me a fancy new pony), and that would be lovely. My affiliate links will never cost you anything (ever! ), but sometimes they may set you up with a discount. Looks very yummy .will try the recipe soon. I love these, especially the idea of stuffing the raspberry with lemon curd! So cute, and a burst of flavour, I bet! Yeah! The lemon curd adds a great little burst of flavour! I’ve never tried making madeleines but these look lovely and I really like the idea of the lemon curd into the raspberry. Yum! You absolutely need to make some madeleines! They’re easy but so delish! These look amazing, would love to try them. What do you use to pipe the lemon curd into the madeleine? Just noticed there is a ? listed for the amount of sugar. What is the amount. Oh dear! I’m sorry about that…! I’ve fixed it now, the amount is 1/3 cup of White Sugar. 🙂 Thank you for noticing and letting me know!! Hope you enjoy the madeleines! I loved these ones! My madeleines turned out perfect, and I only used a spoon to put them in the pan! Mmmm… madeleines! These look so enticing! I can seriously smell them just looking at the screen 🙂 I am definitely making them this weekend! Thanks for visiting Nat!! I hope you enjoy them, they’re one of my favourite things to make! !